The first match of the T20 World Cup 2014 held yesterday. The first match was between India and Pakistan. The match between India and Pakistan always stays to be the most expected match. In the yesterday’s T20 World Cup 2014 match, India won by 7 wickets. More than India and Pakistan match, their World Cup matches are much more interesting. India stays undefeated in World Cup matches against Pakistan. 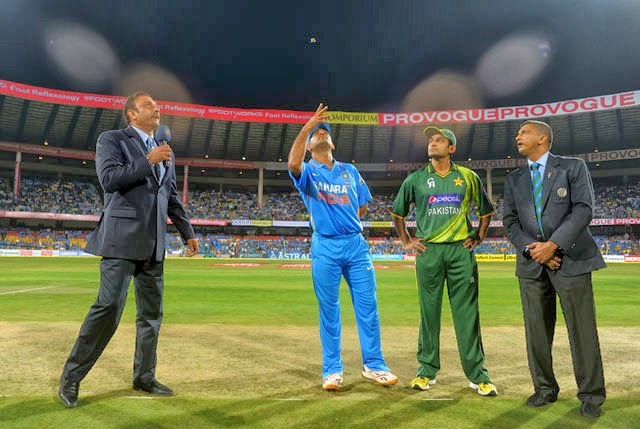 In the first T20 World Cup 2014 match held yesterday, India won the toss and elected to field first. Kamran Akmal and Ahmed Shehzad are the players to enter the crease as the openers of the Pakistan innings. Really, the match between India and Pakistan always stays spicy and grab the attention of all cricket fans. As of it, yesterday’s match was also a spicy game. At the second over of the match, Kamran Akmal have dismissed when Pakistan score was 9. It was a run out dismissal made by Bhuvaneshwar Kumar. Mohammad Hafeez was the next man to enter the crease. Shehzad and Hafeez played a quite good match but both the wickets at the crease had fallen during 8th and 9th over. At the stage, Pakistan were 47/3. Umar Akmal and Shoaib Malik joined hands and played a good innings and made a 50 runs partnership. One of the expected play from Sahid Afridi was not delivered. Sohaib Maqsood scored quick runs at the end to make the Pakistan score 130/7 at the end of 20 overs. Considering the Indian bowling squad, Amit Mishra performed well by taking 2 wickets. Bhuvaneshwar Kumar, Mohammed Shami and Ravindra Jadeja took 1 wicket each. India has set with a target of 131. Rohit Sharma and Shikhar Dhawan are the players to start the Indian innings. Both played well and made a 50 runs partnership for 1st wicket. At 8th over, Shikhar Dhawan has been dismissed for 30. Then the most expected play of the Indian squad by Virat Kohli has started. At 10th over, Rohit Sharma departed for 24. Yuvarj Singh had missed a chance to prove him once again and departed for 1 run. Finally Suresh Raina and Virat Kohli joined hands and took India towards victory. Finally, at 18.3 overs, India made 131/3 and won the match the match by 7 wickets. In Pakistan bowling squad, Umar Gul, Saeed Ajmal and Bilawal Bhatti took 1 wicket each. Dhoni was not quite happy with the performance of Indian team. He said they failed to deliver their complete performance. Hafeez said that they will come with good form for the next match as this match disappointed them. In the points table India holds 2 points. Thus, T20 World Cup 2014 started its way and going to be a good entertainer for everyone.